Actual thoughts: Beatus Apocalypse This piece was from a medieval manuscript from Spain referred to as the Beatus Apocalypse and was written and illustrated by a monk named Beato of Liebana. It is believed that this piece was either created in the 8th or 9th century but it is hard to date this piece because they have only part of it and because it has been reproduced so many times. 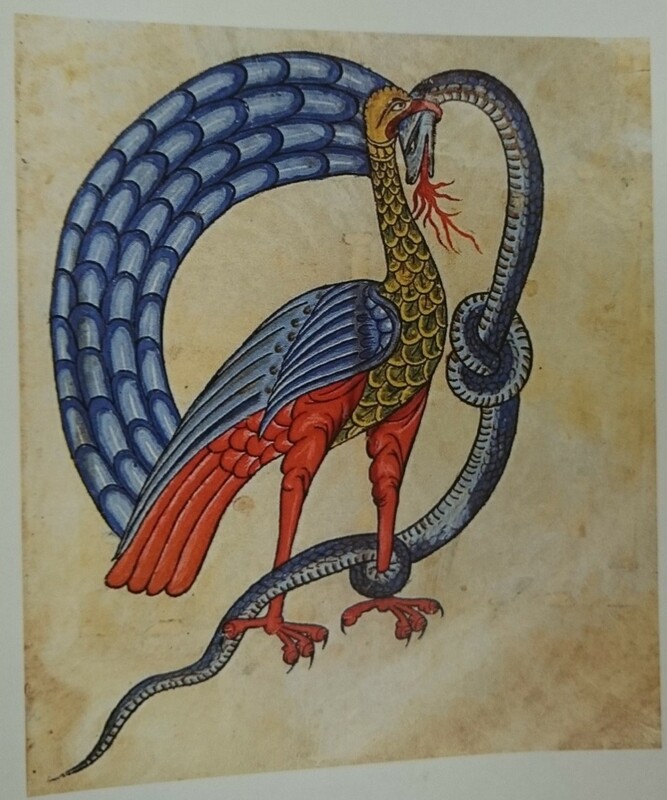 This piece took up an entire page of the manuscript and depicts the image of a bird fighting a serpent. In this case the bird is a symbol of god and the serpent is a symbol for the devil. This symbolism is important to the manuscript because this image is placed at the end, which leaves the reader with a feeling of god overcoming the devil in the final scene, and good winning. This would be important in the society that this manuscript was written in because religion was a fundamental part of everyday life and the trust and belief in god’s victories over evil and the devil was a driving factor in all of their choices. Currently pieces of this manuscript and the other works in this collection of manuscripts are being held in museums around Spain but we could not find which one specifically held this piece.